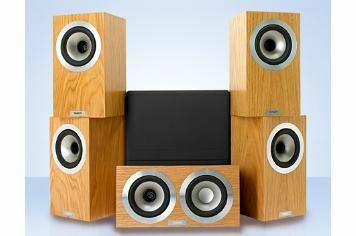 Tannoy Revolution Compact 5.1 review | What Hi-Fi? controlled, well-integrated and cohesive sound. Since its foundation in 1926, Tannoy has become famous for two main reasons. For its public address (PA) systems, and, more interestingly for us, for its revolutionary ‘dual concentric' speaker design – of which this new Revolution Compact 5.1 is an example. Four DC4 satellites do the job of front and back speakers, beside the DC4 LCR centre channel. All boast this innovative construction, with the tweeter housed at the centre of the mid/bass driver. This design, like any other, has positives and negatives for the speaker engineers. It should mean better integration of treble and mid/bass frequencies – they're emanating from the same place – but the ‘single point source' can lead to colouration of certain frequencies. There's more technology to these Revolution DC4 speakers that the dual-concentric drivers. That asymmetrical cabinet is no accident of design, but rather a means by which sound waves can be better dispersed within the cabinet, which should reduce reverberations within the speaker. This is all theory of course. But you don't become a legendary name in hi-fi by accident, and these Tannoy speakers are an excellent example of the form. The clarity and control of the speakers are superb, directing sound with precision without losing dynamic excitement. The opening scene of Casino Royale on Blu-ray bustles with energy and excitement and the Revolution speakers keep a firm grip on events, remaining articulate under pressure and delivering detail and dynamics. That dynamic extension is seriously impressive in this company and it shows that you really don't have to have size on your side to build tension and atmosphere. The subwoofer doesn't match the bigger boxes for weight, but it's punchy, agile and tight – and easy to accommodate – which is a perfectly good and sensible trade in our book. The matching satellites ensure that sounds sweep around the room with cohesion, effects being handed from speaker to speaker with a sleight of hand to make David Copperfield blush. It's worth pointing out, too, just how compact they are. The satellites are far more versatile and easy to house than in many other packages. The Tannoys deliver an engaging stereo listen too, if not quite matching the B&W 685 Theatre system for outright scale and sheer ease of listen; some frequencies sound a little thin by comparison. But this is a fine 5.1 system, with clarity, control, cohesion – and compact dimensions – firmly in its favour.